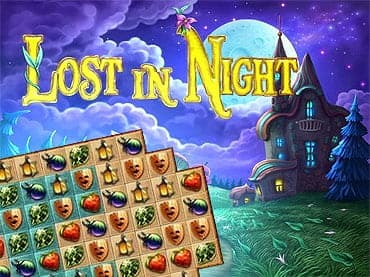 Find your way home to a magical town you never knew existed with Lost in Night, a wonderful matching experience. If you like this free game, try Lost in Reefs 2. A stroll through a dark and hazy night uncovers a most incredible sight. In the distance, you spot a house made from a pumpkin, another from a pear, and one even from a gigantic snail. What magical place have you stumbled upon and will you ever want to leave? Journey to this magical town as you play more than 400 wonderful levels. Enjoy Chain, Group, and Swap mechanics to clear the boards and earn gold coins. With these, you can select a number of different structures to uncover, each more whimsical than the next. With Casual or Timed difficulty settings, a bounty of fun power-ups, and extra play challenges, you're certain to enjoy this casual game challenge. Free Game features: - Discover a magical place you never knew existed in this fantastic Match 3 journey; - Play more than 400 levels to clear different board types; - Enjoy three fabulous game play modes such as Chain, Group, and Swap; - Earn coins to build up the magical place to your liking; - Use fun power-ups to help clear the boards. If you have questions about Lost in Night game, please contact us using this form.